What's in a name? This is my first encounter with Italy's Myriad Lights. As I often do with new bands, I try not take press material too seriously when they describe a band. Give the album a first spin, I say. But their band name had me thinking, some progressive metal, possibly. Not so much. The country of Italy should have been my first clue. 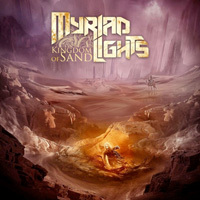 Myriad Lights plays bombastic melodic power metal on this, their second album, Kingdom Of Sand. Yet, even that description requires some clarification. The band was formed by guitarist Francesco Lombardo (when he was seventeen, no less), so everything about this album is very guitar forward. Now one of the first things you wonder when you hear that an album is"guitar-centered" is, are the songs merely platforms for Lombardo's fancy fret work? Yes and no. The riffs and leads are abundant and the focal point of every song. And Lombardo is a terrific guitarist. His lead solos are impressive, blistering and soaring. Conversely, the song arrangements are well-crafted, with each song having its beginning, middle, and end. Melody and harmony are abundant from not only the guitar parts, but also the fine vocal arrangements and keyboard embellishments. A solid rock groove informs most every song as well, giving them momentum and accessibility. So, yeah, Myriad Lights is a guitar-centered band, yet lead by a guitarist who knows how to actually craft a song and be a player in that song. And overall, the results are rather impressive and entertaining. My picks of the litter: the catchy Deathbringer (yes, I know, catchy sounds funny before that title), Mirror, The Deep, and Abyssal March. 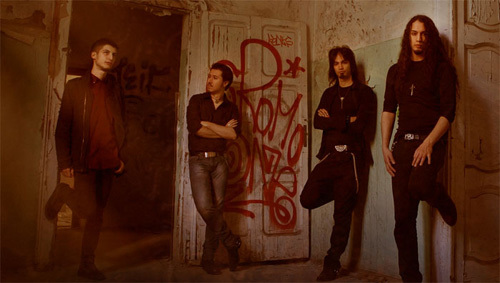 With Kingdom Of Sand, Myriad Lights offers come engaging and entertaining melodic power metal, driven by the exceptional guitar skills of Francesco Lombardo. Recommended.